Airplane lunch pal for toddler. Does your little boy love all things that fly? 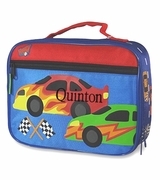 Delight him with an airplane themed lunch box designed to look as if it is about to take off! A propeller in bright red and yellow is located at the top, extended wings on either side are decorated with red flaps and a yellow star and a blue windscreen completes the design. 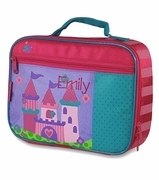 Fun bold colors set on a dark blue background make this bag super attractive for any little person. 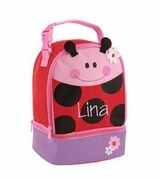 The bag is perfectly sized to hold your toddler's snacks and a drink to take to pre-school or to share on a play date. The handle can be adjusted to fit little hands.